Pictures & Photos of Amiens Cathedral, France. Pictures & images of Amiens Cathedral, France, and its Gothic statues and architecture. The north of France is a haven for enthusiasts of medieval Gothic Cathedrals and Picardy has many fine examples. One of the biggest and best preserved is the Cathedral of Notre Dame in Amiens. The medieval cities of northern France grew rich on trade and were protected by fortifications to keep opportunistic rival Dukes out. Cities also became rich as centres of pilgrimage so competed with each other by building great Cathedrals yo house holy relics. The prize of Amiens Cathedral was the relic of the head of John the Baptist looted during the sack of Constantinople by the Fourth Crusade and returned to Amiens. Amiens was originally built as a Romanesque cathedral in 1152. It was destroyed by fire and rebuilt as a Gothic masterpiece in 1220 by Bishop Evrard de Fouilly. Robert de Luzarches was the architect until 1228, and was followed by Thomas de Cormont until 1258. His son, Renaud de Cormont, acted as the architect until 1288. The chronicle of Corbie gives a completion date for the cathedral of 1266. Finishing works continued, however. Its floors are covered with a number of designs, such as the bent cross (to symbolize Jesus' triumph over death). At 42.3 meters tall its naive is taller than Chartres and Reims Cathedrals but not as high as Beauvais. Amiens cathedral contains the largest medieval interior in Western Europe, supported by 126 pillars. 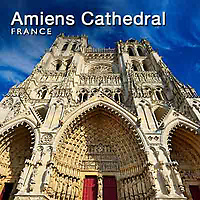 Download Pictures & images of Amiens Cathedral or buy as photo art prints.